Developer askiisoft and slow-mo enthusiasts Devolver Digital have launched their much-anticipated narrative-action game Katana ZERO on Nintendo Switch and PC. Developer Vile Monarch and first-time inhalers Devolver Digital announced that Weedcraft Inc, the first original IP to come from Devolver Digital in its 10-year history, is now available on Steam and GOG for €16.79. Cheerful developer Sectordub and sinister publisher Devolver Digital have released the vibrant adventure / deep state conspiracy game Pikuniku on Nintendo Switch and PC via Steam, GOG, Humble, and itch.io for €12.99. 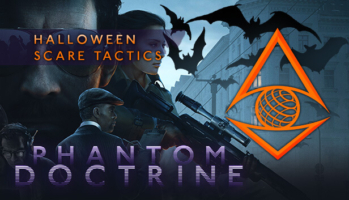 Good Shepherd Entertainment and independent developer CreativeForge Games have released a new free content update for the Cold War thriller strategy game Phantom Doctrine on Steam and GOG. Good Shepherd Entertainment and independent developer Arachnid Games have launched Diluvion: Resubmerged, a major new title update to the original deep sea submarine exploration and action game Diluvion. Free for all Diluvion owners on Windows PC, Mac, and Linux on Sept. 28, Diluvion: Resubmerged adds a plethora of new features and content which combine to offer players an exciting brand-new underwater adventure. The age of industry has arrived on PC and console! Kalypso Media and Gaming Minds Studios are thrilled to announce that highly-anticipated rail tycoon simulator Railway Empire is available today worldwide on Steam, and on PlayStation®4 and Xbox One in the UK, Europe and export territories, with the North American release to follow on 30th January. The boxed retail edition includes a copy of the game’s digital soundtrack, panoramic poster and a printed manual, while the digital version can be purchased through Steam, GOG, the PlayStation® Store and the Xbox Games Store.